In the world of wildlife art, the award-winning Joseph Hautman is one of the true greats. 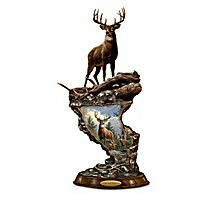 His scientific background and astounding artistic talent are abundantly evident in his nature art masterpiece, “Whitetail Majesty.” Now this self-same work of art debuts as a magnificent cold-cast bronze illuminated sculpture, available only from The Bradford Exchange. The“Whitetail Majesty” Cold-Cast Bronze Illuminated Sculpture makes Joseph Hautman’s artwork come alive in cold-cast bronze at a fraction of the price of solid bronze! Captured in stunning, three-dimensional sculpture like the finest gallery presentations, “Whitetail Majesty” showcases a handsome 10-point stag, a noble prince of the forest. What’s more, Joe’s full-color artwork is showcased on the rocky ridge display below. The sculpture is grandly sized at over one foot high to command attention from any vantage point. Just like gallery lighting, built-in LED illumination softly emanates from behind the artwork, so you feel completely drawn into the beauty and drama of the woodland scene. Displayed with or without illumination, it’s a unique way to enjoy Joseph Hautman’s extraordinary artwork! Inspired by the deer’s habitat, a craggy ridge tops the mahogany-finished display base, which is accented by a golden, gallery-style name plaque. 14 in. H. Requires 3 “AA” batteries, not included.